Similar-shaped to dolphins and sharks, ichthyosaurs - often misidentified as 'swimming dinosaurs' - swam the seas of the Earth for millions of years during the Triassic, Jurassic and Cretaceous periods. 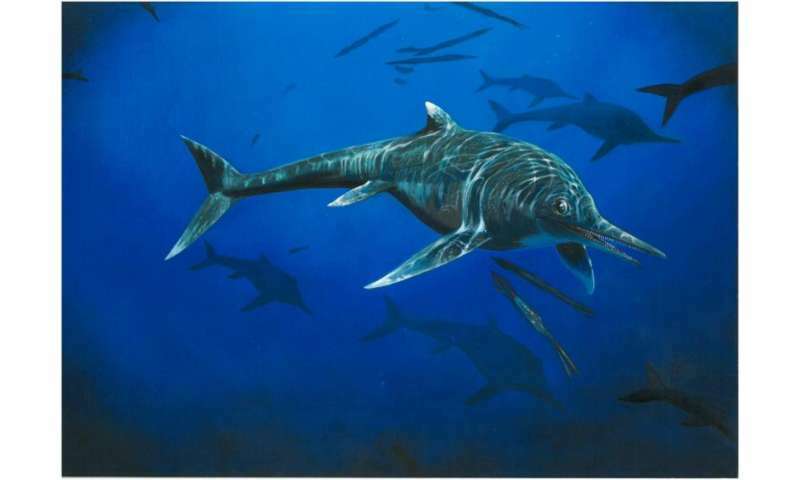 The Nottinghamshire fossil is from the earliest part of the Jurassic Period - 200 million years ago - and only a handful of ichthyosaur species are known from this period, making the discovery very significant. It is also the first time a species of this geological age has been found outside of Dorset and Somerset. Dean Lomax, a palaeontologist and Honorary Scientist at The University of Manchester, examined the specimen after seeing it on a visit to Leicester's New Walk Museum, which acquired the fossil in 1951, and spotted some unusual features. The specimen is relatively complete, consisting of a partial skeleton including a skull, pectoral bones, limbs, pelvis bones, ribs and vertebrae. However, the bones are disorderly - it appears that the carcass 'nosedived' into the seabed before it became fossilised, which may have restricted previous study. "When I first saw this specimen, I knew it was unusual," said Dean. "It displays features in the bones - especially in the coracoid (part of the pectoral girdle) - that I had not seen before in Jurassic ichthyosaurs anywhere in the world. The specimen had never been published, so this rather unusual individual had been awaiting detailed examination." Dr Mark Evans, palaeontologist and curator at New Walk Museum, said: "Parts of the skeleton had previously been on long-term loan to ichthyosaur specialist and former museum curator Dr Robert Appleby, and had only returned to the museum in 2004 after he sadly passed away. He was clearly intrigued by the specimen, and although he worked on it for many years, he had identified it as a previously known species but never published his findings." "Both Judy and Bill have been tremendous mentors for me. They have significantly contributed to palaeontology, especially the study of ichthyosaurs, and I cannot think of a better way to remember them by naming this new ichthyosaur in their honour. Their names will be set in stone forever, pun intended!"